Dashboards can be exported to PDF or image (PNG, JPG) files in order to propagate information inside your organization more easily. The dashboards export feature must be setup prior to being usable. Inside dashboard menu in edit and view mode. After selecting a dashboard in the list, go to actions tab. Inside dashboard menu in list mode. With this one, you can select multiple dashboard exports and export it in one click. Pretty neat, right? 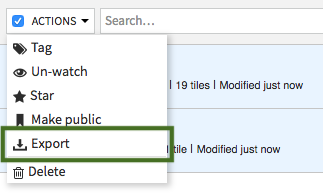 Create a “dashboard export” step that allows you to store an export in a local managed folder. If a standard format (A4 or US Letter) is chosen, images dimensions will be calculated based on your screen resolution and the chosen orientation (Landscape or Portrait). On the contrary, Custom format allow to set custom width and height.